Warning: potential spoilers for Batman v Superman: Dawn of Justice are ahead! For most of Batman v Superman: Dawn of Justice’s production, Lex Luthor was the only official antagonist identified by the cast and crew. It was only in the past few months that Doomsday was confirmed as the physical baddie who the eponymous heroes and Wonder Woman will battle. Now, with the movie only a few months away, a third villain is rumored to appear, though only in a minor capacity: Bizarro! Instead of Batman v Superman: Dawn of Justice throwing yet another opponent the DC Trinity, Latino-Review has heard that the freakish Superman doppelgänger will be set up as a future threat for 2017’s Justice League: Part One. It’s unclear how exactly Bizarro would be created in this universe, though logic suggests that Lex Luthor would be the culprit responsible, given his scientific background and history with the creature. In the comics, Bizarro is typically the result of an experiment gone wrong trying to clone Superman, though in the pre-Crisis on Infinite Earths era, the Bizarro eventually created a Bizarro Earth so he could live with others like himself. In the modern era, Luthor is usually behind Bizarro’s creation, as he tried to create a clone of Superman to eliminate the real deal. Bizarro’s most recognizable for his chalky (sometimes stone-like) visage and his backwards way of speaking. His power set is mostly the same as Superman’s, though a few of his abilities are the "opposite" of the Man of Steel’s, like having freeze vision instead of heat vision. It was briefly theorized that the monster seen in the latest trailer Batman v Superman: Dawn of Justice was actually Bizarro rather than Doomsday, but Zack Snyder and several others have confirmed Doomsday is indeed the monstrosity being advertised. If Bizarro does have a role in Justice League: Part One, it’s a good bet that he wouldn’t be the movie’s main antagonist. It’s more likely he would be a side threat that Superman and a few of the other heroes might deal with, akin to how the Avengers dealt with Baron von Strucker and his HYDRA forces at the beginning of Avengers: Age of Ultron. 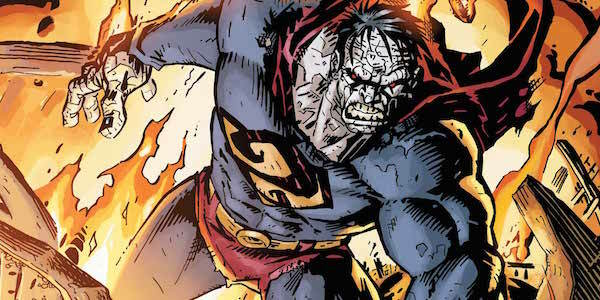 Even if Bizarro won’t be seen in Batman v Superman: Dawn of Justice, DC Comics fans won’t have to wait long to see a version of Bizarro in live action. CBS’s Supergirl is introducing a Bizarro version of the Girl of Steel in the near future, played by Hope Lauren. Outside of the comics, Bizarro has been seen in shows like Superman: The Animated Series and Smallville. Although Superman III featured Christopher Reeves’ Superman deal with an evil copy of himself, Bizarro has yet to be featured on the big screen, so appearing the the DCEU would be his biggest appearance yet. If this report doesn’t pan out, maybe there’s a spot for him if a direct sequel to Man of Steel ever gets made (as in one without most of his Justice League teammates). With or without Bizarro, Batman v Superman: Dawn of Justice’s heroes will deal with Lex Luthor and Doomsday when the movie hits theaters on March 25, 2016.